If you are new to biking, you probably don’t know the bike friendly routes just yet, but the good thing is, My City Bikes (MYB) is here to help. Finding mountain bike or urban trails is easy to navigate on your city app. - Bike lanes- a dedicated space on the road for bicyclists marked by stripes and signs, keep an eye out for solid and dotted lines. - Sidewalks- might seem like a good idea but can sometimes be more dangerous. - Construction- try to avoid all together. - Shoulder space- this is extra important if there are no bike lanes or sidewalks. 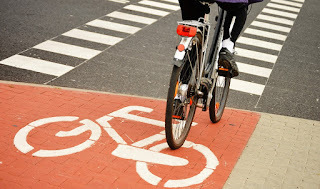 - Heavy traffic- if is not safe for any bicyclist, but beginners should take extra precaution. While you will want to do your own assessment, Google Maps also has a feature that will give you bike routes, and if you need extra help, your local bike shops are full of people who are familiar with the roads. Bike smart.